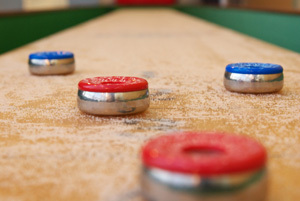 Our purpose is to have fellow Red Men and Pocohantas members of the Shuffleboard League to enjoy the game of shuffleboard, conversation and fellowship every Tuesday during the season. Our season runs from the third week of September and continues for 26 weeks. One of our goals is to take a yearly spring bus trip to a gambling casino for fun. We also to take part of two fund raisers for Charity, and one of these fund raisers provides money for one of our local Food Banks at Christmas. Red Men and Pocohantas members are encouraged to join the Shuffleboard League as openings occur.